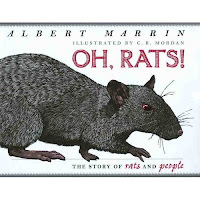 Abby the Librarian: Book Review: Oh, Rats! Happy Nonfiction Monday!! Do be sure to check out the great posts collected over at Picture Book of the Day. Today, I've got another Caudill review for you, the only nonfiction book on the list. Did you know that rats can be flushed down a toilet a live? Did you know that rats sometimes fish with their tails? Did you know that a pair of rats could have 359 million descendants in 3 years? If you didn't know any of those superbly interesting facts, you'd better go out and obtain a copy of Oh, Rats! It's filled to the brim with interesting facts about rats. Now, I don't know about you, but when I think of rats, I tend to think about disease-infested vermin biting babies and eating all our food. (Remember Lady and the Tramp?? That rat that attacked the baby?!) Well, imagine my surprise to find out that rats are not all bad. Certainly, our author presents the unappealing facts along with the cute-and-cuddly-rats-as-pets angle. But, as Marrin experienced himself, once you learn about rats they become much less scary. Illustrations in black, white, and crimson decorate the book and sidebars on nearly every page provide additional fun facts. Although I do like the illustrations, they were a bit distracting because the full-page pictures do not have labels and sometimes I couldn't figure out what they were supposed to be illustrating. Mr. Marrin provides a bibliography at the end, as well as a short list of recommended reading. The neat thing is that he also includes a list of fictional books that feature rats as (good or evil) characters. I guess I was left wanting a little more from his bibliography and I wish he had included an author's note. But I will say that it's a greatly entertaining book and likely to appeal to kids. Also reviewed by A Fuse #8 Production. Wow...perhaps this will change my "dirty vermin" impression of rats.